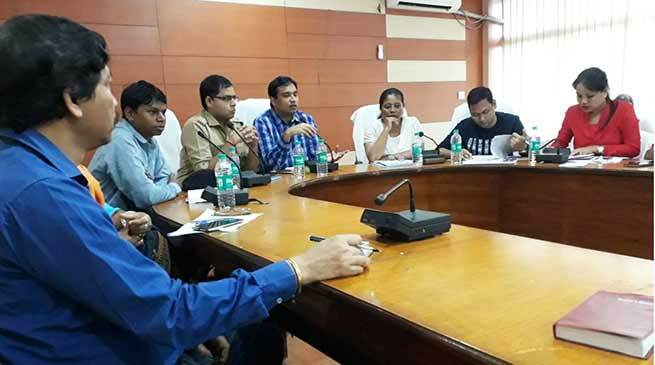 Ahead of the onset of monsoons, the District Disaster Management Authority (DDMA), Hailakandi, Assam convened a meeting to discuss flood preparedness to tackle any exigency. Chairing the meeting of DDMA at his office conference hall here today, Deputy Commissioner Adil Khan reviewed the status of preparedness by the Water Resources Department and other line departments for dealing with floods in the district. Khan directed all the concerned departments to prepare a comprehensive action plan encompassing both pre flood preparedness and post flood management – and submit the same within a week. Khan asked the Water Resources Department to work on a war footing for repairing and strengthening of embankments and take up anti-erosion work within a month. “The onus lies on the Water Resources Department to reduce the impact of floods through flood protection measures. It must ensure that no breaches or seepages occur or else strict action will be initiated against the responsible officers. He warned that action as per Sections 33, 34, 51, 55 and 56 of the Disaster Management Act, 2005 will be taken against those officials who fail to comply with the instructions of the District Disaster Management Authority. He asked the APDCL to adopt all measures to ensure no electrocution occurs. “If there is any case of electrocution, the officials will have to face punitive action,” he cautioned. He directed the PWD to identify vulnerable roads, bridges and culverts and keep them in good shape for transporting relief materials to the flood affected areas. The Deputy Commissioner asked the Inland Water Transport to keep sufficient number of motor and country boats for rescue and relief operations. Directing all the concerned departments to remain alert to avoid any untoward incident, Khan underscored the need to make all possible arrangements in flood prone areas to minimise damage and prevent loss of lives. “Adequate arrangements have to be made to meet any exigency during floods ,” he added. He asked the departments to identify highlands to provide shelter to humans and animals. “Safe places for evacuation of marooned people and animals need to be identified,” he said. Khan instructed the Veterinary and Animal Husbandry Department to keep a plan ready to dispose off the carcasses to prevent epidemic and to identify suitable places for the purpose. He asked the Health Department to keep in readiness quick response teams and mobile medical teams and sufficient stock of medicine. Khan instructed the Public Health Engineering Department to ensure safe drinking water to the flood affected people. He asked the Food and Civil Supplies Department to keep sufficient quantity of foodgrains and made it clear that rice would be procured from FCI only. The Deputy Commissioner asked the authorities concerned to make operational the flood control room from April 15. Instruction was also issued to the Water Resources Department to set up a control room. Khan reviewed the status of preparedness with heads of Agriculture, Education, Transport and Fisheries Departments. The Deputy Commissioner asked the Circle Officers to hold the circle level disaster management committee meeting and co-opt any member, if required, for smooth execution of flood related measures. Superintendent of Police, Mohneesh Mishra, ADC, Ruth Lienthang, Circle Officers and district heads of line departments were present in the meeting.